Tennessee Junior Duck Stamp Program. The Federal Junior Duck Stamp Conservation and Design Program is a dynamic art and science-based curriculum that teaches students wetland and waterfowl conservation to students in kindergarten through high school. The program encourages students to explore their natural world, invites them to investigate biology and wildlife management principles and challenges them to express and share what they have learned with others. The program uses the environment as the theme to creatively teach core subjects. Instead of writing a research paper, students draw, paint, or cut and glue what they have learned! Students are encouraged to design a duck stamp depicting a native North American waterfowl species in their natural habitat and submit their artwork for an art competition. The Junior Duck Stamp Art Contest is the culmination of the Junior Duck Stamp educational program. After studying waterfowl anatomy and habitat, students express their newfound knowledge by drawing or painting a picture of an eligible North American waterfowl species. Students from across the United States submit their artwork to their state, territory or district art competition. 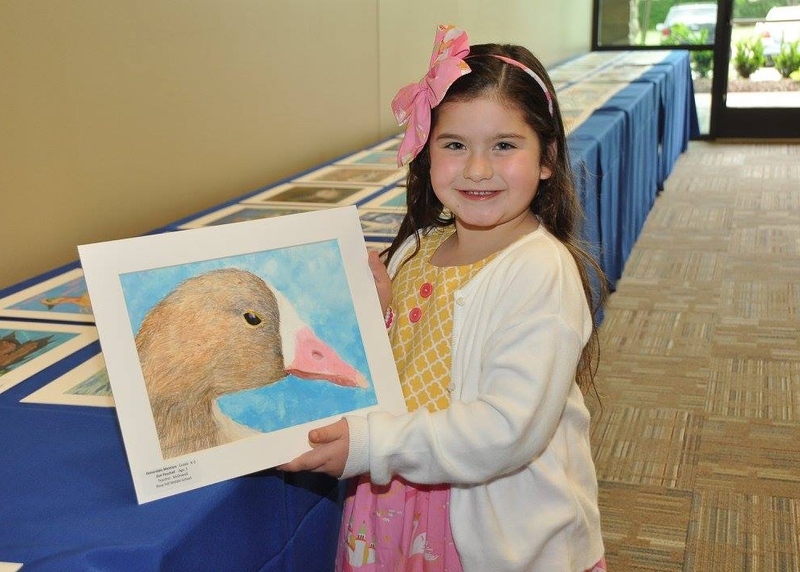 The “Best of Show” from each competition is submitted to the National Junior Duck Stamp Art Contest, where judges select one image to become the next Junior Duck Stamp, as well as a winning conservation message. The top three artists at the national level and the winning conservation message receive scholarships, and students receive awards at the state level. When students submit an entry in the Tennessee competition, they have the chance to win some great prizes and even attend an awards ceremony in Brentwood, TN. Every entry will receive a Certificate of Participation. 100 Tennessee students (25 in each grade group) receive beautiful first, second, third, or honorable mention ribbons (groups are K-3, 4-6, 7-9, and 10-12). 36 first, second and third place winners will receive special engraved Junior Duck Stamp plaques. The Tennessee Best of Show winner receives the Jeanette Rudy $1,000 college scholarship, and their artwork on the state waterfowl stamp. The Tennessee Best of Show will go on to compete in the national Junior Duck Stamp contest. The first place national winner receives a $1,000 cash award, a free trip to Washington, D.C. with parent and teacher, to attend the Federal Duck Stamp Contest, and his/her winning design is used on the Federal Junior Duck Stamp. The second place national winner receives a $500 cash award; and the third place national winner receives a $200 cash award. National Conservation Message first place receives $200. Eighteen year old Brienna Miller from LaFollette won top honors for 2018 with a pair of Northern shovelers in colored pencil and pastel. The Tennessee Federal Junior Duck Stamp Design Contest was held March 27 at the Tennessee National Wildlife Refuge in Henry County. Brienna will received the $1,000 Jeanette Rudy scholarship provided by the Tennessee Wildlife Resources Foundation, along with other prizes, including a framed 2017 Federal Duck Stamp Print. Sixteen year old Alana Clark from Chattanooga won top honors with her colored pencil portrayal of a Northern Pintail. The competition was held March 22nd at the Tennessee National Wildlife Refuge. Alana received the Jeanette Rudy $1,000 college scholarship provided by TWRF and her artwork will be on the state junior waterfowl stamp for the year. Alana’s artwork was also sent to the national level, where her entry competed with 50 other state Best of Show winners on April 21st, 2017. This program is FREE to enter and participate! The national program is sponsored by the U. S. Fish & Wildlife Service and includes fully correlated national curriculum. All entries for the Tennessee art competition are due on March 15 each year. Soon after the annual entry deadline, the artwork is judged by a panel of experts. The judges change each year, but the panel typically includes a combination of waterfowl biologists, artists, and natural resource professionals. The art is separated into four grade groups (K-3, 4-6, 7-9, and 10-12), and each group is judged independently. Once the first place winners for each group have been selected, they are viewed again to select a single Best of Show for the state. In Tennessee, the program is run under the office of the Tennessee National Wildlife Refuge with the help of partners such as the Tennessee Wildlife Resource Agency, Tennessee Wildlife Resources Foundation, Ducks Unlimited and the Friends of Tennessee National Wildlife Refuge.